UST faculty/college where alumni here belongs | One for UST!!! Just wanted to know which college/faculty alumni here in ONE FOR UST ONLINE belong. Due to creation of new colleges and institutes in the recent years, its better to just vote for the faculty/college under one which actually graduated from. And then maybe just explain your answer in the message boards. An alumni can vote for 2 or more faculty/college if you finished more than 1 program in the university. Between how a city was and what it has become is a journey worth telling. That is what lies at the core of one of History’s latest offering, “Around The World With Voyager,” a five-part series that explores the “unique evolution” of five Asian cities through the eyes of their respective icons and their inspiring success stories. In tracing Brillante’s journey to filmmaking, “Around The World With Voyager” host Scott Woodward, a notable Singapore-based Canadian photographer, will join the former in visiting various places in Manila that proved instrumental in his career. Brillante’s most recent works are also both internationally acclaimed: “Captive,” starring French actress Isabelle Huppert, and the 2012 Metro Manila Film Festival entry “Thy Womb,” led by Philippine Superstar Nora Aunor. Aside from Manila, “Around The World With Voyager” also has episodes on Taipei (Taiwan), Hong Kong, Jodhpur (India), and Hanoi (Vietnam). Recreating the expedition of 20th Century traders who paved the way for global trade, Scott has sailed in the 187-foot long Voyager yacht for the show. The yacht is owned by the esteemed company John Walker & Sons, and its inclusion in the series is seen as a fitting tribute. The show’s inspiration is the classic travel guide “Around the World,” developed with the help of the company’s distributors and that which chronicled the old explorations of John Walker & Sons as it bravely sailed across unfamiliar territories. The “Around The World With Voyager” episode featuring Brillante airs Jan. 14 at 11 p.m.
History is available on SKYCable Ch. 25; Cable Link Ch. 44; Dream Satellite Ch. 30; Destiny Cable Ch. 57. Just saw the episode of History Channel's Around the world with Voyager. Ganda ng UST hehe. Proud to be Thomasian with the likes of Mendoza. Dr. Vicki Belo, the foremost figure in the Philippine beauty industry, scored another landmark distinction this week when she was tapped by BBC World News for a feature on the Asian ideal of beauty. Belo was part of a panel of guests that discussed skin whitening and the Asian ideal of beauty in an episode of "Impact," a show that focuses on Asia Pacific events hosted by Babita Sharma on BBC World News. Sharma discussed Asia's love affair with fair skin, the medical treatments and products associated with it, and the health and cultural implications of this widespread practice. Belo, recognized internationally as the biggest name in the Philippine cosmetic scene, was a resource speaker along with Asian-born model Tuey Mac, and Dr. Ayan Panja. Belo talked about how the Belo Medical Group first began offering whitening treatments some six years ago in response to overwhelming client demand. The skin lightening industry is one of the most lucrative markets in the Asia Pacific, valued at a whopping 13 billion USD. The interview aired on Feb. 20 as part of the "Impact" series, reaching an average of 76 million viewers around the globe each week. Nicknamed The Jet he represented the country in the 2004 Summer Olympics. He is also a famous practical shooter, having won the country's nationals several times starting at the age of 16. At 18, he competed, and won the U.S. Steel Challenge World Speed Shooting Competition(1990). He would go on and win two more times, 1992-1993. He is only 1 of 5 people, male and female, to have won the competition more than 2 times. Thomasian World Bowling Champion Engelberto Biboy Rivera indeed lived with this battle cry as he finally won the gold on a bigger stage, becoming the seventh Filipino World Bowling Champion last September in South Korea the same country where he bungled an Asian Games gold four years back. It's not everyday that one is given the chance to be the World Champion, so I might as well make the most out of it, Rivera said. Rivera bowled the perfect pitch to down seasoned Achim Gwarobski of Germany, 300-212, for the Masters gold medal that aligned him with Filipino bowling Hall-of- Famers Paeng Nepomuceno and Bong Coo. Rivera's flawless outing only happened for the 13th time in the tournament history. A 1997 UST Tourism graduate, Rivera originally wanted to be part of the UST Growling Tigers, having been a high school varsity standout at Don Bosco Makati. The five-foot-seven Rivera, however, could not crack the team because of his height. But with the zeal of competition running through his veins, Rivera looked for another sport that would fit his physique and give him a chance to excel once more. And bowling was the perfect choice. From then on, Rivera joined various bowling tournaments. He won his first gold in the Youth Quarterly Finals in 1993. Rivera also has won gold medals in various local and international tournaments, including the Hongkong International Tenpin Bowling Championships (2004), the 17th Hongkong Asian Championships in the Doubles Division (2002), and the Asia Masters Champion (2001). Rivera said consistency is of primordial importance in bowling since there is no defense in the sport. I just always give my 100 per cent in every shot and in every frame, kaya maganda ang nagiging resulta, he said. When he failed to pocket the Asian Games gold for the Philippines in 2002, Rivera vowed to redeem himself, under all circumstances. True enough, he made the pressure-packed perfect game in the World Championship decider despite a left knee patella injury. I did not bother to think of my Asian Games debacle because it will only jeopardize my dreams of avenging my loss and becoming a World Champion, Rivera told the Varsitarian. With the Masters gold medal, Rivera ended the Philippines 26-year title drought of the World Bowling Championships. Ollie Ongtawco was the last Filipino champion in 1979. After the World Championship, the fight continues for the one-time 1996 Benavides Achievement Award recipient. Rivera is again gunning for gold in the ongoing 15th Asian Games in Doha, Qatar. In fact, Rivera skipped a tournament in Hong Kong and the World Cup qualifying meet to go full-time for the Asiad training. He has won the WTBA World Tenpin Bowling Championships in 2006 and the Asian Games gold medal for men's singles bowling in 2010. Rivera is also the recipient of the Philippine Sportwriters' Association (PSA) Athlete of the Year Award twice (in 2006 and 2011). Rivera won 10 championships from the Southeast Asian level up to the world stage culminating in his 2006 World Championships win. He has won a gold medal in the 2001 Southeast Asian Games in Kuala Lumpur and in the 2002 Asian Championships in Hong Kong, he teamed up with fellow Filipino Chester King to win the men's doubles gold. He is also a regular fixture at the Asian Bowling circuit culminating in a runner-up finish in the Grand Slam finals in 2009. Aside from his 2006 World Championship win, he has won runners-up finishes from the World Cup back in 2010 and 2011. She is a three-time Southeast Asian Games gold medalist. She has been recognized as the Philippines’ first woman world pool champion. A member of the Philippine Billiard's team, Rubilen hails from the province of Cebu. She graduated from University of Santo Tomas. She made a name in the 2005 Southeast Asian Games by winning two of the gold medals staked in the women’s division. She is the protege of the local billiards godfather Aristeo “Putch” Puyat and under the intense drills of her coach of many years, Boyet Asonto. She is the 1st-Runner Up in the 2006 and 2007 WPA Amway Women's World 9-Ball Championships in Taiwan and had also won the 2002 Asian 8-Ball Championship in Singapore and was the first woman to qualify in the men’s National Open finals. In December 2007, Amite finished first in the women's 9-ball pool singles during the 24th Southeast Asian Games held in Thailand. In 2009, Amit won the Women’s World 10-Ball Championship, 10-4, against world 9-ball queen Liu Shin Mei of Taipei. Rubilen was a classmate of my younger brother in college. I saw her personally when I visited my brother at school. She was skinny back then and held a two-inch thick Accounting book instead of a pool cue. MANILA, Philippines - Four Filipinos, including two tycoons, a perfume manufacturer and an architect, landed on Forbes Asia magazine's list of top philanthropists in the region. Henry Sy, Sr., the country's richest man, and John L. Gokongwei Jr. were included in the magazine's annual Heroes of Philanthropy list. Top architect Felino "Jun" A. Palafox Jr. was also on the list, along with mass market perfume manufacturer Joel S. Cruz. The 88-year-old Sy is the founder and chairman of the SM Group, whose businesses include shopping malls, condos, banks and department stores. Forbes Asia cited the tycoon for giving $7 million to De La Salle University to build an eco-friendly building for the school, and donating $112 million to an un-named foundation. Gokongwei, who founded conglomerate JG Summit, is chairman of one of the Philippines' most endowed foundations - the Gokongwei Brothers Foundation. He started the foundation with his three brothers in 1992. In 2006, he gifted the foundation with half of his shares in JG Summit, a donation which is now worth more than $1 billion. "The foundation is the conglomerate’s largest shareholder, with a 29.4% stake worth $2.3 billion. Disbursements are funded out of company dividends and are focused on education," Forbes Asia said. 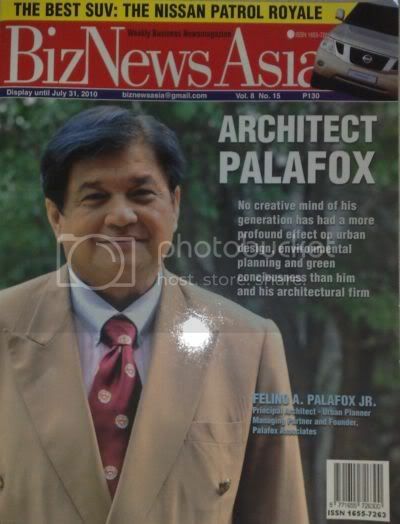 Palafox, founder and managing partner of Palafox and Associates, was cited by Forbes Asia for donating the firm's services for the design of low-income housing developments. This includes a 12-hectare project for the Smokey Mountain dumpsite community in Manila. "A former Catholic seminary student, (Palafox) gives money to a program helping needy churches and in the last 5 years, his firm has done pro bono architectural and interior design or master planning for 6 church-related projects," Forbes Asia said. Cruz, 48, is the founder and CEO of Central Affirmative Co., which makes Aficionado Germany. Forbes Asia cited Cruz for making donations to help abandoned children, as well as elderly and disabled. "Each year his company — the manufacturer of Aficionado Germany, the country’s leading mass market perfume brand — celebrates its anniversary by giving cash to charities and paying employees to volunteer for a day. Nicknamed the “Lord of Scents,” he plans to launch the Joel S. Cruz Aficionado Foundation in the next year," Forbes Asia said. Forbes Asia's annual Heroes of Philanthropy list highlights 48 of the region's "most remarkable givers". "The selections are subjective and we aimed for a mix of notable people and causes. We also try to identify new philanthropists each year and pick only true philanthropists who are giving their own money, not their company’s because donating shareholder funds isn’t charity. By calling attention to these charitable souls, we hope to encourage more giving," John Koppisch, Senior Editor, Forbes Asia, said in a statement. Other noted philanthropists on Forbes Asia's list were India's biotech entrepreneur Kiran Mazumdar-Show; South Korean musician Cho Yong-pil; Chinese CEO Zhang Xin; Japanese talk show host Tetsuko Kuroyanagi; and Miss Universe Malaysia Deborah Henry. Congratulations to Jun Palafox who will become a Gusi Peace laureate in November, 2011 in the field of architecture and urban planning. On 16 March 1950, Felino Palafox, Jr. was born in Bacarra, Ilocos Norte. His father, Dr. Felino Palafox, is a UST Medical Alumnus and his mother is Natividad Albano. At the age of 13, he entered the Christ the King Seminary where he had a Classical Secondary Education. He graduated from the University of Santo Tomas in 1972 with a Bachelor’s Degree in Architecture. Two years later, he obtained a Master’s Degree in Environmental Planning at the University of the Philippines through a scholarship from the United Nations Development Program (UNDP). In 2003, he graduated in Advanced Management Development Program (AMDP) for Real Estate at the Harvard University in Cambridge, Massachusetts. He worked at the Planning and Development Office (PPDO) of the Department of Public Works Transportation and Communication (DPWTC). He was a Project Officer for UNDP Manila Bay Region Strategic Planning Project, and a Senior Planner/Team Leader for Development Planning of the World Bank-funded MMetroplan (Metro Manila Transport Land Use and Development Planning Project) - a joint project of the Government of the Philippines and Halcrow Fox of London. In 1975, he married Wilma Villanueva; they had their first daughter (Chin) a year later. In 1977, at age of 27, he was name-hired to work in Dubai, United Arab Emirates, at the Town Planning Department of Dubai Municipality. He collaborated with multinational and professional staff for four years. Karmi, their second daughter was born in Dubai in March of 1981. Their last child, Philip Khalil was born in Manila in 1982. Upon Architect Palafox’s return to the country, he worked with Henry Sy, Sr. of the SM Group of Companies and with the Ayala Corporation where he was an Architect, Urban Planner and Assistant Vice President of the Technical Planning Staff. Eventually in July 1989, he founded Palafox Associates where he works both as an architect and urban planner. Among his first clients were the Sys, the Ocampos, Taipans and Sheiks. He has led Palafox Associates to be included in the Top 500 Architectural Firms in the World (London-based World Architecture Magazine-no. 94 in 2006); awarded BCI Asia’s Leader in Architecture for 7 consecutive years, and the only ISO 9001 and 14001 certified design firm in the Philippines for Architecture, Planning and Design by TÜV Germany. He is registered as an Asia-Pacific Economic Cooperation (APEC) Architect. He is a recipient of several local and international awards such as the Ambassador for Peace from the Interreligious and International Federation for World Peace given in New York, Most Outstanding Architect given by the City of Manila, and Most Outstanding Resident for Community Development given by the City of Makati. Recently, he was included in People Asia’s People of the Year (2010) and BizNews Asia’s The Best of the Best in 2010. He is also an active officer of various organizations: Environment Committee Chairman of the American Chamber of Commerce, Member and Past Vice-President of the Rotary Club of Manila, Governor of the Global Peace Association-Philippines, Member and Past Chairman of FIABCI Philippines, Member of the National Real Estate Association, Lifetime Member of the Philippine Institute of Environmental Planners, Fellow of the United Architects of the Philippines, Member and Chairman of the Philippine Chamber of Commerce Philippines-UAE Business Council; international associate/member of international organizations like the American Institute of Architects, U.S. Green Building Council, Urban Land Institute, Congress for the New Urbanism, American Planning Association, and the International Council of Shopping Centers; and Country Representative for the Council for Tall Buildings and Urban Habitat - all based in the USA. Throughout the 22 years of Palafox Associates, he continues to guide his company with the utmost of integrity. In 2011, he was elected President of the Management Association of the Philippines (MAP), a 60-year-old management organization whose members represent a cross-section of CEOs, COOs and other top management practitioners from various multinational companies in the Philippines. As the President of MAP, he proposed to undertake the theme “MAPping a Culture of Integrity,” which aims to address corruption for good governance, criminality for better peace and order, and climate change for protection and enhancement of the environment. THE success story of Joel Cruz was told to me by my good friend, Goule Gorospe and I think it is very inspiring. Joel Cruz reminds me of Severina de Asis, my neighbor in San Juan and owner of Jo-Liza Antiques. If there be a common denominator between these two personalities, they are both smart – yes, street smart and I look up to and respect people with this quality. According to Goule, Joel started his Joel Cruz Enterprises Inc. as a manufacturer of garments and supplied what he produced to leading department stores in Metro Manila. In 1997, with the glut in the market of clothes from China and Thailand, Joel decided to switch to the perfume business and this was the beginning of big things to come. Building his own manufacturing plant in Meycauayan, Bulacan, Joel offered business partnerships to many people. Through Franchising, Dealership, and international and domestic distributorship Joel Cruz eventually became known as "The Lord of Scents" and today, the three brands he created are total hits. Eleven years ago, Joel first introduced his "Aficionado Germany Perfume". The local market loved it - so seven lears later, he came up with his "Joel Cruz Signatures" which is now on its 4th dynamic year. Recently, Joel Cruz re-launched "Aficionado Your Fashion Scents Store", currently with ten (10) boutiques nationwide. Joel Cruz’s products are available in kiosks, selling in all the leading malls, supermarkets, drugstores, and convenience stores, all over the Philippines. With his 400 stores (growing in number), Joel also has 400 direct dealers who also carry his scents. One can find an array of affordable fashion items from classic to trendy garment pieces and accessories at Joel’s "Aficionado Your Fashion Store(s)". As Joel Cruz is passionate about fashion, he is a fastidious dresser. Apart from wearing his own apparel brand, he also enjoys using clothes by Goulee Gorospe, Oliver Tolentino and his fellow Thomasian Eric Pineda. At work, when his creative juices are squeezed, he meticulously looks into the different elements of his products and imposes high quality standards on them. For his home at his Pearl of the Orient Condominiun unit along Roxas Boulevard, he chose every piece of furniture for its interiors - so apt for his title, the "Lord of Scents". Hard working as Joel has made himself to be, he makes it a point to be with family regularly in their Sampaloc, Manila home. After a long day’s work, he finds relaxation by visiting their family home which is "a stone’s throw away" from his multi-level office. Success for Joel does not end here. He has more projects envisioned towards the future of his company and the people who will benefit from their work with it. Fashion and perfume will always be entwined in Joel’s work and lifestyle. I am glad we have Joel Cruz to make us look and smell g-o-o-d.
Joel Cruz’s life story will always be fascinating and inspiring for people with Hope in their hearts. Such inspiration will become reality when hope and prayer is combined with productivity.